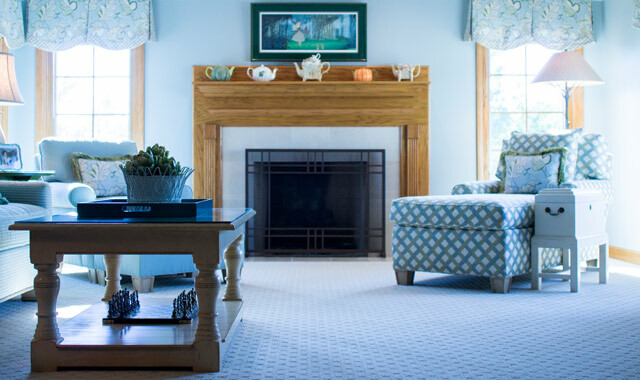 Susanne and Mark Frey’s new upstairs family room has been transformed into a relaxing Cape Cod-inspired retreat that’s comfortable for these empty nesters and their visiting family members. For the past 17 years, Susanne and Mark Frey have enjoyed their two-story Crystal Lake home. They fondly recall their children, who are now adults, spending their free time in the upstairs family room, just down the hall from the bedrooms. Recently, these empty nesters decided that, rather than let the room collect dust, it was time to convert the space into something functional and fun. The Freys turned to interior design firm Wickham Interiors, 67 N. Williams St., in Crystal Lake. President Lynne Wickham, ASID, started the business in 1982. The firm has refurbished several rooms throughout the Freys’ home and is currently helping with a kitchen remodeling project. In its place came a soft-textured sofa in blues, greens and creams, along with a soft-blue lounge chair and ottoman. A Destin coffee table, with a butter pecan finish, anchors the room. The sofa is flanked with two Narragansett tables in a green jellybean finish. A distressed chest, in a vanilla bean finish, sits next to the chaise lounge. “Lynne came up with a great idea to have a chaise lounge in the corner, which is a nice place to put your feet up and read a book,” says Susanne. Other standout features include a spacious bookcase, a desk area, a flat-screen TV and a cherry oak fireplace mantle. The Freys love their new room. It’s a place where their children can relax in privacy, and the grandchildren can watch movies and play games. Mike and Lynda Trimarco knew it was time for a change in the dining room of their St. Charles home. So, about 1.5 years ago, the Trimarcos enlisted the help of Strawflower Shop, an interior design firm and home accents retailer at 210 W. State St., in Geneva. Strawflower’s influence is all over the Trimarcos’ home. “For the past eight years, we’ve done a Strawflower project every year, just by going through the house, picking a room and updating it,” Mike says. “They’ve freshened up our living room, den, family room, bedrooms, sunroom and kitchen.” Up next, he adds, is the basement. The furniture was replaced with a handmade dining room table and chairs from the Foxglove line. Brigham replaced the china cabinet with a buffet table and mirror against a long wall. “I took out another display cabinet against another wall and added a nicer, narrower piece and angled it for another dimension,” says Brigham, who added a small console near the stairs to fill an empty space. Window treatments were swapped out, and a beautiful chandelier was installed over the table. Brigham also added smaller accents, like a table runner, a new art piece above the console and a floral centerpiece. “Accessories pull it all together,” says Brigham. Initially, Mike didn’t think much of the idea, but quickly changed his mind. “I like the lower, softer lighting, rather than using the bright chandelier,” he says. Not everything is new. Brigham opted not to paint the cinnamon-colored walls, which matched the new furniture perfectly. Most of the artwork and a fine area rug remained. Overall, the project took less than six weeks to complete. Both the homeowners and designer are pleased with the results. This entry was posted on Tuesday, September 30th, 2014 at 12:00 pm	and is filed under Home & Garden, Top Posts. You can follow any responses to this entry through the RSS 2.0 feed. Both comments and pings are currently closed.